Anyone involved with Classical Conversations knows that Cycle 3 is all about the United States for Geography. 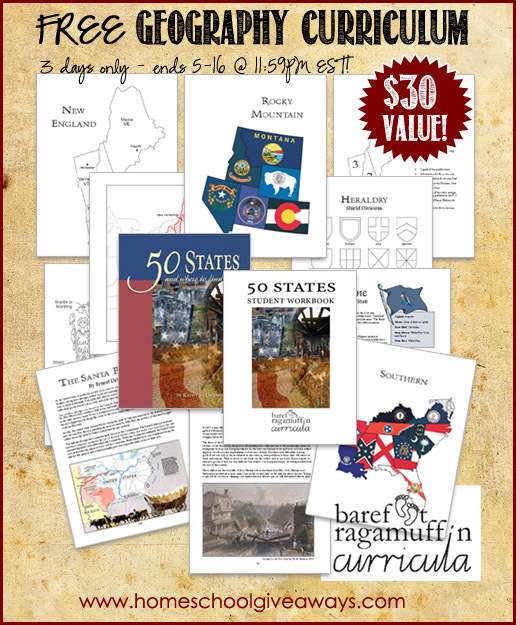 Head on over to Homeschool Giveaways and pick up this freebie before it expires on Friday! Whether you’re sure you’ll be using it or not — get it before it’s gone! This would also make for great summer activities for any kid who’s studying US Geography or state history. Included is 50 States and Where to Find Them, which teaches children the states and capitals region by region through mapping exercises and quality literature. Children fill out a map of the region as they learn about each state. State lessons include historical information about the state and coloring pages of the state flower, state bird, and state flag. Each region wraps up with a crossword puzzle, a word search, and a bonus lesson pertaining to the region. Bonus lessons include topics such as heraldry, the Erie Canal, and the Underground Railroad. Also included is The Student Workbook for 50 States and Where to Find Them which is a necessary component of this program. It includes all of the printable, reproducible sheets needed to complete the work. I love free! Did you know that most library systems allow you to print for free too? My local library system will even let you print a limited amount in color! Check out the libraries where you live – they are a great place to stretch your budget! Yippee!